I just love butterfly season. Click here and here (and on 'Butterfly' in the caption) if you do, too. I love your site! The pictures of your animals warm my heart. I am glad that they had you on the list of noted bloggers. Lovely summer color. I have tried growing them but for some reason they failed to thrive. I will try again next year. If I can keep our neighborhood rabbit out of the garden I might get more things to grow! She is cute though! I tried your recipe for the breakfast bars and they turned out yummy! Check out the picture on my blog. Hi, 1st time at your site. there are no farms like yours. Will add you to my fav. list. Really amazed to surf your site. Real life story of my dream. I always dreamt about a large farm where I will get the real peace and happyness of life. Thanks for the sharing and best of luck. so glad this is a blog of note, I may never have found it otherwise and that would've been a shame. I love your photographs and recipes! What kind of flowers are those? Amazing color! Thanks so much and welcome to the farm! 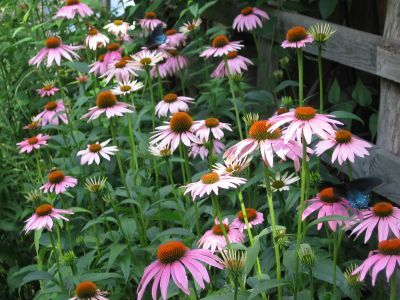 For some reason echinacea literally grows like a weed here. You can see it in huge masses all along the rural highways--gorgeous when it is blooming. It's hard to grow so many things here, but when something does adapt itself to our crazy climate, it goes gangbusters. Thankfully echinacea is one of those things! LOL, last night I put up a photo of a bunny I busted in my garden on my garden blog. The farm is just hopping with rabbits this year. Welcome to the farm. So glad you enjoyed your e-visit. I look forward to hearing from you again. Thanks for all the kind words. Yes, I have written articles and columns for various magazines. And yes, I am currently in the process of pitching some book ideas to publishers. I'm not familiar with Harvest--will have to check it out. Thanks for the other links, too. I'm so glad this was a Blog Of Note, too. So many wonderful new readers! Thanks for taking the time to write and say hello.